Visit uncommon places in Argentinian and Chilean Patagonia. Penguin colonies different from what’s seen till now. Experience the highlights of Magallanes. Fernando de Magallanes (1480-1521): He was a Portuguese navigator who discovered the Austral Strait that bears his name and connects the two oceans: The Atlantic and The Pacific. The expedition that took him as far as the Strait was the one that sailed around the world for the very first time. When we thought about creating this Fly & Drive programme, we focused on the Strait that was named after Magallanes. A place filled with history that divides the Austral zone of Argentina and Chile in two. With this 7 nights programme your travellers will have the possibility of taking self-guided walks with the help of a GPS device. They´ll be able to visit historic “Estancias” still active, drive along routes that go through a myriad of landscapes and reach the Pinguino Rey Park(King penguin) next to Porvenir Village where they´ll be in direct contact with this species that´s not easy to catch sight of on trips to Patagonia. This round trip, that starts and ends in Ushuaia, is the perfect choice for travellers that love to get acquainted with the history of the place and who look forward to being in contact with nature. They´ll stay at Hotels, Estancias and Inns in faraway locations. This tour includes two cruises across the Magallanes Strait. The first of the cruises is over Primera Angostura, a short duration trip of about 20 minutes that is the main means of transportation to go from Ushuaia to Punta Arenas and back. The second cruise leaves at 9AM from Punta Arenas towards Porvenir Village and takes approximately 2 hours to reach our destination. 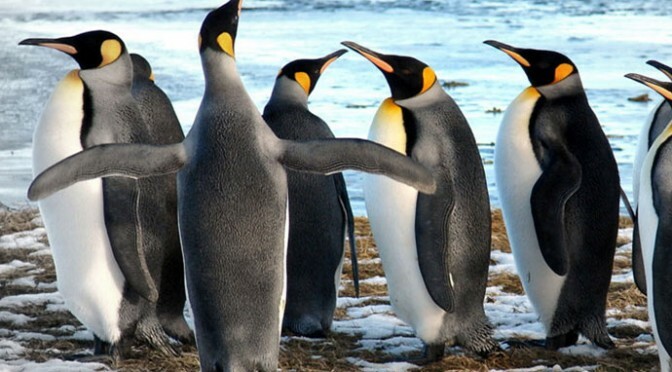 Just a few minutes from there you´ll find the Pinguino Rey Park(King penguin). This circumpolar species lives on the Antarctic Continent where the Western winds blow and build their nests around Inutil Bay on the Big Island of Tierra del Fuego in Chile. At the same time you can sight them in the nearby islands to South America(Malvinas and South Georgias Islands), Africa(Prince Edward and Cozet Islands), and Oceania(Kerguelen and Macquarie Islands). It´s because of this how important it is for Nature lovers to visit this natural paradise as this species is not easy to sight in other parts of the world. Some of the main characteristics of this penguin are: a yellow-orange patch high on the chest, a yellow-orange patch on each side of the head, a black long beak with an orange line down the sides and a hook at the end, and webbed feet with claws for swimming. Bring your travellers along to experience this trip travelling the routes in Tierra del Fuego and Patagonia while having direct contact with tradition and nature. Ask your Kallpa´s Account Executive for a detailed brochure and set off on a trip with your passengers right now.